If you’re looking for a church, you’re probably going to Google the churches in your area. If a new person is looking to visit your church, they’re probably going to find you based on search results. Your website is the first exposure the potential guest has to your congregation, values, and identity. Most people will check out a church online before they check it out in real life. So, needless to say, a good website is pretty important. Hope Church is a network of churches throughout New York City. The network of churches created a website that was meant specifically for potential visitors. We selected Hope’s website as this year’s winner because of its clear focus on first timers. The website has no frills, is pretty straight-to-the-point, and offers clear direction for next steps. 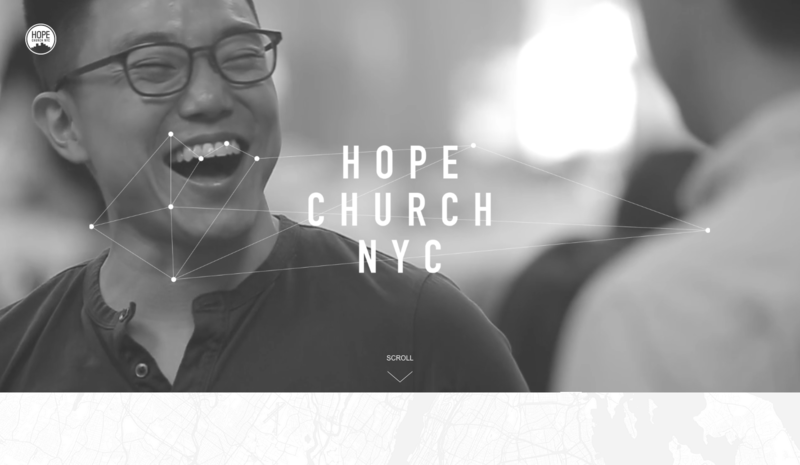 Gage Hunt, Hope’s Creative Director at the time, built their website to give an identity to the network of churches and connect the visitor to a local congregation. The website quickly casts vision, then connects the visitor to its locations right away. The simplicity of the website helps force a clear and concise message to the website visitor. So what can your church learn from Hope’s website? Quite a few things, actually. We chose Hope as this year’s winner because of the clear focus and simplicity of the message. A lot of church websites try to be everything and the kitchen sink. Many websites try to answer every possible question, provide every piece of information, and have all the details for every possible inquiry. The problem with that approach is that churches lose focus of the goal of their website. Does your website have a clear focus? Is your church representing your congregation well? How is your website connecting visitors to your church?